Since 1948 Follett has led the industry in designing and manufacturing high quality, innovative ice storage bins, ice storage and transport systems, ice machines, ice and water dispensers, and ice and beverage dispensers. Their goal to reach 100% customer satisfaction has resulted in equipment that provides outstanding innovation and design excellence. They dedicate themselves to providing the most customer-oriented service in the industry. 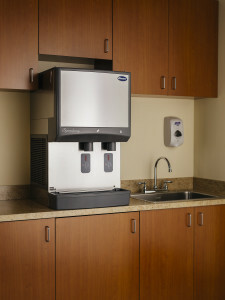 Follett offers a wide selection of attractive, space-saving countertop, wall mount and freestanding ice and water dispensers. The newly redesigned Symphony Plus 425 series offers automatic, self-flushing, semi-automatic cleaning and sanitizing, and Quiet Night™ sleep mode. Countertop and freestanding models come with lever or SensorSAFE™ infrared dispensing for even more convenience and sanitation. Wall mount models offer SensorSAFE dispensing only.